Skulduggery and Valkyrie are back. They have brought the Dead Men with them. But war has come. Not a war between good and evil (like the war against Melevolent), not between light and dark, but between the good. Like civil war. Sanctuaries against Sanctuaries. The Supreme Council. Friends against friends. Allies against allies. That war of the Sanctuaries is not the only war raging. The battle is a strong soul, against an evil god. Valkyrie can only hold on for so long. One slip could just be the end of the world. Darkquesse will burn everything and everyone. The world and everything on it will turn to ashes. Now the war has been supercharged, literally. The Accelerator is the only thing that can hold Darkquesse. But someone is using it to supercharge sorcerers. Everything must come to an end. Is this the end of life itself? I actually don’t know. 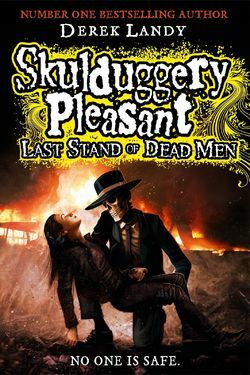 It is all resolved in the next two Skulduggery books. Which I have yet to binge on. Ready, set, BINGE! !